We’re going to start with an example that displays a combination of both. Listen to Example 1, the opening of the second movement (Venus, the Bringer of Peace) in the suite entitled “The Planets” by Gustav Holst. After an opening solo horn playing an upward scalar line, four flutes and three oboes play closed harmonies in similar scalar patterns over the horn’s repeat of the same line. The flutes and oboes are playing in their normal registers, nothing that would surprise a section member. Example 1. Gustav Holst: The Planets. II. Venus, The Bringer of Peace. Opening. In the next few measures the pattern is repeated, down a third but with three clarinets substituted for the three oboes. Compared to the brilliant, metallic sound we just heard, there is a richness in the middle of the soundscape. The clarinets bring this to the mix in the fatness of the sound generated in this part of their range. This was missing from the reedy and brighter-sounding oboes. Granted, this is a subtle difference, but that’s one of the assets that a great orchestration will have: nuance. One more note on this passage recalls an older post, entitled “The Hand-off” and this technique is displayed here in both parts of this passage. When the flutes end on their eighth-note in measure five, the oboes, at first at least, sound almost like flutes. Once the sound continues, though, the reediness of the oboes (sustaining a D-flat minor triad) can be perceived. In the next woodwind passage, once the clarinets drop out at the beginning of measure 10, the ear knows that the sound (a B-flat minor triad) is all flutes, but the richness of the clarinets are suddenly missing. In last week’s “Blind Dates and Other Pairings 1” posts, an example of bassoons supporting a horn and helping to make one horn sound similar to a horn trio. This was in the Mendelssohn Nocturne from the incidental music to A Midsummer Night’s Dream. There was also an example of how two clarinets and two bassoons playing the same rhythm in harmony maintained their sonic individuality. This was in the slow movement of the Brahms third symphony. In Example 2 the clarinets and bassoons have it both ways. In an articulated passage with the same four players, we can hear each one’s individual contribution when the quick articulation is played, specifically the first two beats of the bar. However, we also hear them as more of an ensemble on the more sustained passage in the last two beats of the bar. This is true for both iterations in the passage. What becomes clear on hearing these examples is how articulation can be such a major factor in determining what sound the audience will hear. This can even be seen in the example of last week’s passage from the Ravel Bolero. When the flute and muted trumpet sustain notes, one can discern that the sound is not a solo instrument, but it’s difficult to say precisely what the sounds are. Yet, when the flute and trumpet play their sixteenth notes, it becomes easier to recognize the two distinct voices. Example 3 has a passage from the first movement of Mahler’s sixth symphony. It begins with percussion, followed by three trumpets and three oboes playing a major triad, which becomes a minor one, and then hands off the support of the melody to the rest of the woodwinds. The first oboe continues to play the melody in this chorale-like passage with two flutes added to it. What is especially of interest is the two flutes playing the inner voices. As the passage continues the second and third oboes are added to these inner flute lines. To add to the richness of the sound, the second clarinet and first bassoon enter to produce the bottom – a very high bottom – of these chords. At the end of the first part of the passage, the first eight measures, the two flutes and first clarinet now present the top line of the chorale. Some of the inner oboe voices are now replaced by clarinets. It’s also noteworthy to see that in order to change the timbre, Mahler has the first horn replace the bassoon, again doubled with a clarinet. Mahler echoes the major-minor chord change in the penultimate measure of the example. You can see that Mahler has two horns playing “stopped” doubled with the first and second oboes. This will add to the nasal sound of the chord as the flutes drop out and the oboes and a newly added English horn combine to give a new timbre to the passage. In one final (for this passage, at least) bit of maneuvering half-way through that penultimate measure, both the English horn and the first clarinet, end their unison doubling of the first oboe as Mahler makes this passages rapidly diminish to nothing but the three oboes, just prior to the pick-up to the larger ensemble that follows. During this passage the pizzicato strings have been tossing a short melody around the section. As the passage ends, the chromaticism of these chords reveal how the sound has changed during the passage supporting and enhancing the harmonies. Finally, we examine another passage for large orchestra, the ballet by Stravinsky, The Firebird. Section 6 of the ballet is entitled The Firebird’s Supplications. There’s a passage (see Example 4) where Stravinsky has three bassoons and a contrabassoon sustaining an open fifth in two octaves (A-E) with two clarinets also sustaining an A plus an added B. A third clarinet has a slow rhythmic pattern of even eighth-notes alternating between B and D. The pizzicato strings and one harp “hits” this cluster on the downbeat of the measure. An item of particular interest is the combination of instruments playing the melody and how that sound mixes with the sustained instrumental sound. 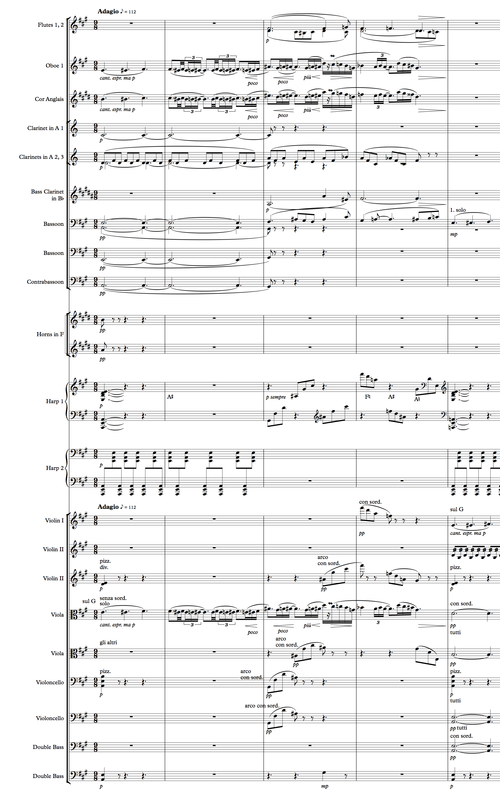 Listen to Example 5 (displaying only the woodwinds) and hear the melody played in unison by the first oboe, the English horn, and a solo viola. The violist might normally play these notes on the D string, but Stravinsky instructs the performers to play on the G string. This will produce a slightly brighter and even nasal sound because the notes are higher up on the fingerboard and will produce fewer overtones. The sound blends perfectly with the two double-reeds. The sustained chord, played in the lower registers by the bassoons and clarinets, would typically have a fat and rich sound. Yet, assigning the oboe and English horn to the melody in their rich, lower registers, the reedy sounds they normally produce are crystal clear. The biting, reedy sound of the melody appears to absorb the sustained harmonies in the lower woodwinds, producing a sound that is overall akin to the oboes. As in some of the earlier examples, this one too has the harmonies and timbres changed when the melody repeats its rhythmic pattern in the third measure. All but one bassoon drop out as well as the clarinets and only the flutes and the one bassoon continue to sustain tones. The second flute – at the extreme bottom of its range – and the one bassoon have a small counter melody. Always an interesting and innovative orchestrator, Stravinsky has the string section play eighth-notes in large upward and then downward leaps over measures three and four in the example, each one handing off the triplet line to the next. These quiet and muted passages with their initial upward leaps of a seventh contribute to the change in tonality and timbre in those measures. (There are some sounds that Stravinsky creates here that one can hear in later works, especially by Bernard Hermann in his score for Alfred Hitchcock’s film Vertigo.) The harp doubles the string parts, articulating and emphasizing them. The importance of understanding what sounds each instrument creates can not be overstated. Simply knowing what an oboe, clarinet, bassoon, horn, trombone, or any other instrument sounds like when it plays middle C is a must-have for anyone interested in learning orchestration. On the other hand, it’s also important to give yourself a break. This is not easy to learn, especially without an orchestra at one’s disposal. And, whereas a hardware or software synthesizer can assist the budding orchestrator, there is nothing quite as valuable as sitting with a performer and asking questions. The composers whose music we’ve examined were all creative artists attempting to contribute their unique voice to the orchestra canon. These works each represent primary examples of orchestration by these masters. Listening to a variety of recordings of them, studying the scores, and discussing the music with instrumentalists can only help one to learn about their skills and contribute to one’s own.